Need a diversion? Looking for an interesting shooting game you can play on an iPhone or iPad as well as your home computer? The Guns & Ammo Point of Impact Shooting Game lets you select a firearm type, then shoot it for accuracy in “virtual ranges” modeled after the Scottsdale (AZ) Gun Club. No this is NOT another Zombie Game, or First-Person-Shooter kill-fest. It is NOT based on the Point of Impact book by author Stephen Hunter. Point of Impact is a skill-oriented, arcade-style gun simulator presented by the National Shooting Sports Foundation (NSSF). It lets you test your skills in target shooting scenarios, with a wide selection of virtual firearms and targets. *WARNING: We are not aware of any issues with this software and it passed multiple virus scans for us. However, as with any software, installation of this program can take resources and slow your machine down. Also, a software conflict could cause other programs to crash or run more slowly. For these reasons, we recommend that you NOT install this software on a work computer. If you choose to install the computer version on your home computer, and you don’t like it, or you get bored with it, you should uninstall the program from your home PC or laptop. Credit Research Assistant Edlongrange for sourcing this game report. 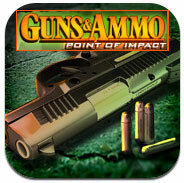 Share the post "Point of Impact Target Shooting Game from Guns & Ammo"